Hi everyone! Today, I have two cards to share with you featuring the newest exclusive limited-edition stamp and die set made by My Favorite Things especially for Ellen Hutson as part of the United We Flourish campaign. Most of the supplies I used for both projects are linked in the list at the bottom of this post. For the first card, I decided to create a scene with dogs. 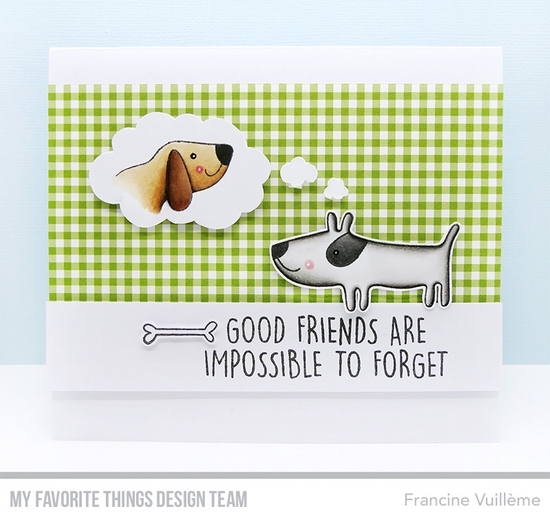 I used two dogs and the sentiment from the Good Friends stamp set. As I needed two dogs facing each other, I used the mirror stamping technique for the dog on the left. The trees are from the Trees in the Forest Die-namics. The grassy borders are from the Spring Scene Builder and the Grassy Fields die sets. The cloud border is from the Stitched Cloud Edges. I created the rainbow using MFT cardstock. I just cut thin strips using a trimmer. I sponged the grassy borders as well as the trees with Distress inks using blending tools for more depth. For the second card, I went for a clean layout. I cut out the bubbles using scissors. The patterned paper is from the Tiny Check paper pack. 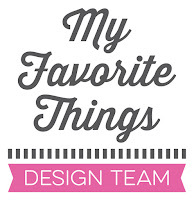 Head over to the MFT blog to check out what the other MFT and EH design team members have created with this set! For more inspiration, you can also check my MFT Gallery on Pinterest, my Facebook page, my YouTube channel or my Instagram feed! Your cards are absolutely adorable !! I love the dream bubble in the second one, so creative ! These are super cute and I love love LOVE the dream bubble !!! What adorable cards! I love both of them!